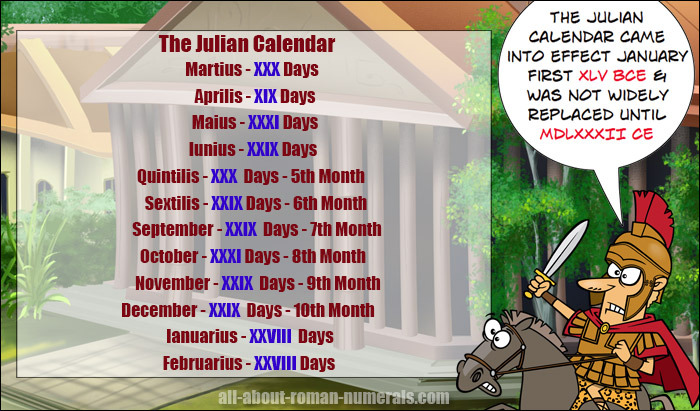 The first Roman calendar had CCCIV days and X months and was incredibly inaccurate. Over the years the calendar was refined but was still quite inaccurate and needed to be replaced because it was out of sync with religious festivals and crop planting. The new calendar had CCCLV days, divided into XII months and a leap year day every IV years added to February. In VIII BCE the Romans renamed two of the months. The month of July was named after Julius Caesar for his empire expanding military conquests. The month of August was named after Augustus Caesar who defeated Cleopatra and Marc Antony and saved Rome. It is said Julius Caesar had an extra day added to July which was taken from February but this is unlikely. It is also thought that an extra day was added to August, also taken from February, so no one could say either man was greater that the other. i.e. both months now have XXXI days and February XXVIII. Isn’t it funny that things that happened over MM years ago still affect us today.